The Henderson family sailed into Sydney on “The Harbinger” on 30 December 1853. The seas were calm, the weather fine and the temperature a pleasant 75 degrees Fahrenheit. Sailing into Sydney Harbour on such a day would have been a wonderful welcome to their new home and raised their hopes for a bright future. It is not known exactly where the family lived when they first arrived in Sydney, or how arrangements were made for their accommodation when they landed. 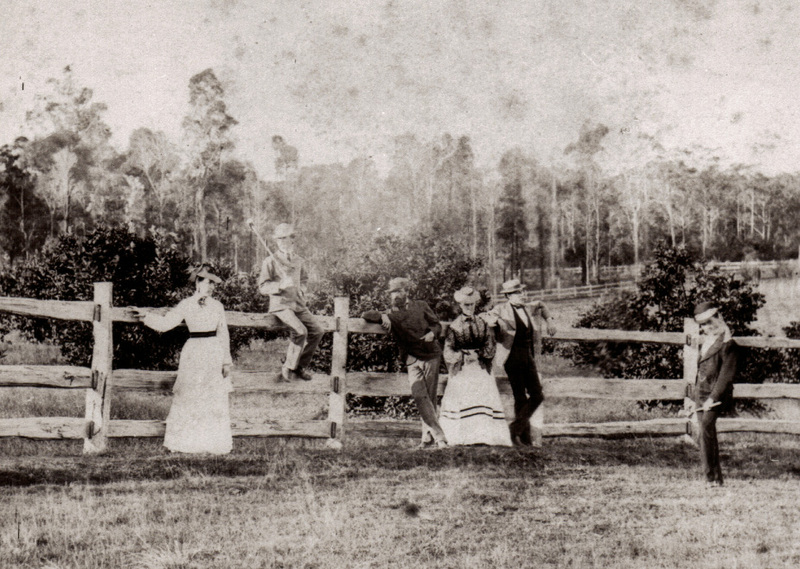 It is not until 1855 that there is another record which shows them settled in Newtown with Charles Henderson writing in his “Recollections” which were published in the Royal Australian Historical Society’s Journal and Proceedings, (Volume VIII) in 1923, that in 1855 they lived in Newtown. He describes the house as being on the north side of the road, from the toll bar. The toll bar crossed King Street at the corner of Forbes Street. 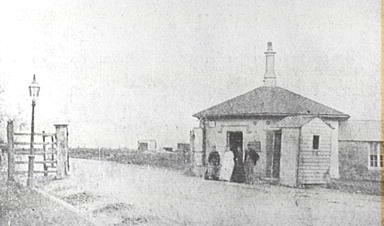 This picture of the toll bar and the toll gatekeeper taken around 1870 show little development in the area. In 1848 the Gazetteer of the Australian Colonies described Newtown as a ‘beautiful village’ of about 323 houses and 1,215 inhabitants. 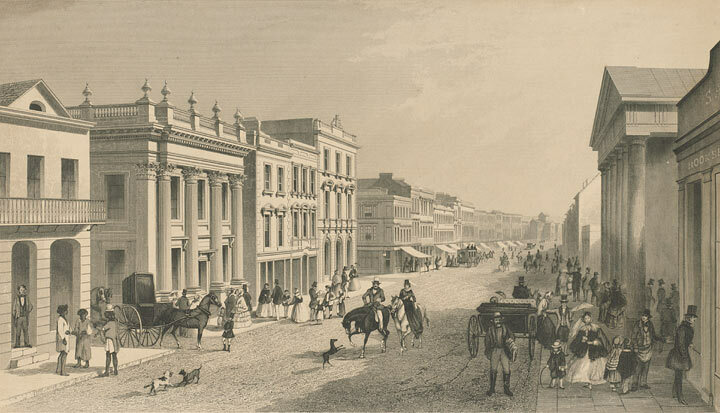 The suburb was however growing rapidly and in 1858, Newtown was described as “a large suburb of rather superior character… the high street (having) an important appearance similar to that of many villages in the neighbourhood of London. There are good shops, chapels, road side residences. 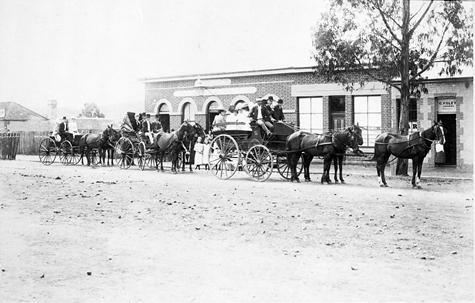 There is a post office, railway station and the terminus of a line of omnibuses….”As a whole the appearance of the Newtown district is pleasing compared with either Redfern on one side and Camperdown on the other”. (Jevons, W. S. Social Survey of Australian Cities, unpublished manuscript. 1859. Mitchell Library).. There are also a number of advertisements in the Sydney Morning Herald from 1855 that indicate that Thomas Henderson had now established his business as a Law Stationer and House Agent with an office at 42 Elizabeth Street, Sydney. Their time in Newtown saw the birth of another son, Harry. Harry was born on 9th May 1855 but he died eight days later. The details of the birth and death of Harry is found on the list in Cruden’s Concordance, (held by Dinah Harvey) and as civil registration did not begin until March 1856 his name does not appear in any official records. When the Hendersons arrived in Sydney in 1853 there were virtually no roads beyond the perimeter of the city but in 1855 the first railway opened from Sydney to Parramatta and saw the expansion of development beyond the city and the growth of suburbs. 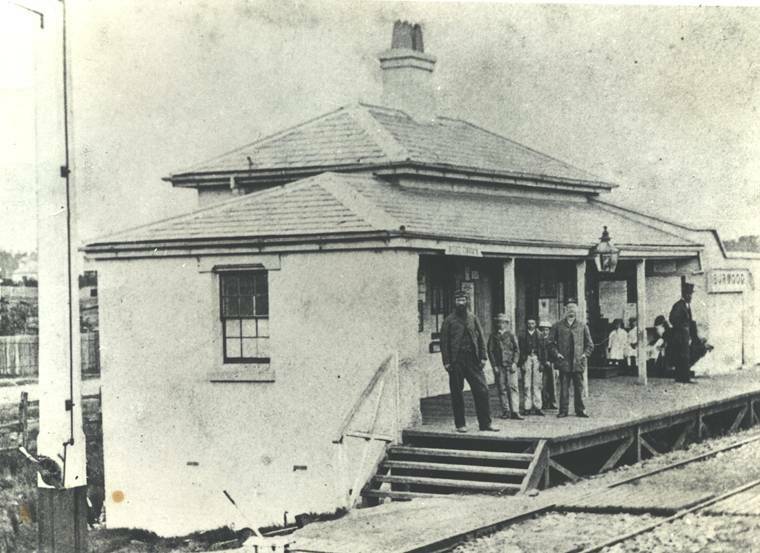 By 1858 the family had moved to a cottage in Lucas Road, Burwood and Thomas took advantage of the new rail link to travel to the city for work. Thomas’ son Charles must have enjoyed this move as he described this area in “Recollections”. Surrounding the area where they lived was Edrop’s Bush where he was captivated by the birds he saw there. Their move to Burwood saw the birth of another daughter and the last of their children. Alice Mary was born on 1 November 1858 when her mother was 41 years old. There was also cause for more celebration the following year when their second daughter, Margaret, married Stephen Biggs at St Thomas’s Church, Enfield on 19February 1859. A W Biggs, presumably “Mr‟ owned Lot 2 of the Redmire Estate in the early days, and perhaps it is through this connection that the couple met. Their first child, Ellen Margaret Biggs, and Thomas and Margaret’s first grandchild was born on 6 December 1859. Over the next twenty two years Margaret and Stephen were to have ten children in total. It was to be six more years before another of their children married. 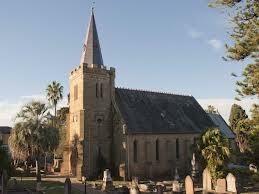 On 13 September 1866, Thomas and Margaret’s daughter, Betsy Deane, married Joseph Boardman in Armidale. It would appear that they met when they were both teaching at what was described on their marriage certificate as the Church of England Denominational School, Armidale. Joseph Boardman was headmaster of the school which was described in the Maitland Mercury and Hunter River General Advertiser in 1866 as “a substantially built brick building, and contains one room, of an extra large size, and sometimes used for public meetings on that account. Adjoining theschool room are apartments occupied by the resident teacher and his family. The school is well attended, and is I believe in other respects in a flourishing and satisfactory condition. On every hand I heard Mr. Boardman’s ability as a teacher very highly spoken of, and it is to that circumstance doubtless that the present prosperity ofthe school is mainly attributable”. This was Joseph’s second marriage and with her marriage at the age of 26 years Betsy became step mother to seven children under the age of ten year from Joseph’s previous marriage. In addition to this already large family in 1869, Betsy was to give birth to the first of the four sons of their marriage. The family appears to have settled into life in Australia but it was still not without incident. Thomas was injured in a fatal rail accident that occurred on 6 January 1868 which was reported in the Sydney Morning Herald: “Mr Thomas Alfred Henderson, in the office of Messrs Billyard and Curtis, was much hurt. His face was cut and bruised and he had severe contusion on the leg. His son who was in the same carriage with him escaped with but trifling injury”. In other reports of the accident Thomas is described as a clerk in the office of Billyard and Curtis. William Billyard had been appointed Crown Solicitor for civil business from 1850 until 1859, as well as having a private practice as a solicitor. It is through this business relationship that Thomas became involved in the subdivision and sale of the Redmire Estate at Strathfield. The Redmire Estate, comprised land granted, first to James Wilshire, and subsequently to Samuel Terry, which was bought and subdivided for sale in 1866 by William Billyard. 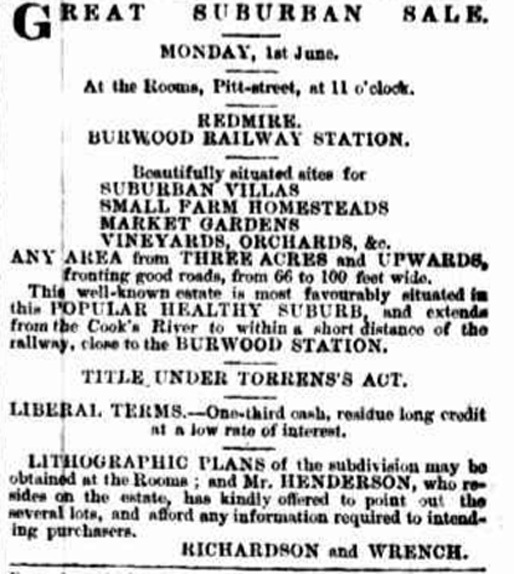 An advertisement appeared in the Sydney Morning Herald on Saturday 6th October 1867 informing prospective purchasers that blocks were available from three to thirteen acres, “distant little more than a quarter of a mile from the Burwood Station, and only eight miles by road from Sydney”. There was space for country residences with gardens, shrubberies and orchards. “With a view to ascertain the adaptability of the land for the purpose of garden and orchard culture, the property was recently inspected by a gentleman eminently skilled in the cultivation of the vine and orange who had discovered much virgin soil of 1 -24 inches”. The land possessed the “greatest natural facilities for drainage” and “to a large extent the timber has been preserved”. Advertisment for sale of redmire estateillustrating Thomas Henderson’s role in the sales of the estate. A Memorandum of Transfer dated 4 November 1867 shows receipt of payment of twenty shillings by William Billyard from T A Henderson for Lot 3 of the subdivision of the Redmire Estate Wilshire’s Grant covering an area of nine acres one rood and twenty three perches. Four months later the property was mortgaged to his son in law, Stephen Biggs, for one hundred and fifty pounds. The funds from the mortgage were probably used to meet the costs of constructing their new home with the mortgage being quickly discharged on 21 May 1868. Thomas then decided to increase the size of his holding in Redmire Estate with a further transfer from W Billyard for Lot 4 for the sum of £91.17.6 occurring on 25 August 1868. As Lot 4 was a block of a similar size it is likely that the cost of the first lot was discounted or in payment for Thomas’ services in the sale of the estate. The property faced four streets, Homebush Road, Albyn Road, Victoria Street and Redmyre Road. At last Margaret had her country home and they named the farm, Seven Oaks, after the town of Margaret’s birth. This was the first house built on Redmire Estate and in order to provide additional income to the family it also operated a dairy and orchard. Most households of this period kept servants and for a property of this size at least two men would have been required to work in the dairy and orchard with a cook and general servant for the house. Even with servants, life would still have been demanding for the women of the family. They were responsible for ensuring that the household was clean and comfortable, making beds, cleaning lamps, washing windows, skinning and preparing meat for cooking, making preserves and wine, cooking daily meals on a wood stove, dusting, sweeping, scrubbing, sewing, doing the laundry in a large copper heated by a wood fire and ironing, all without the benefit of modern day appliances. The house and farm buildings can be seen in the background. The farm cottage appears larger than the usual homestead. Based on an interview given by Mrs Elizabeth Ward, whose father purchased the property in 1892, the cottage comprised six large rooms in the main building and as with other homesteads of the period had a detached kitchen and laundry at the back. Mrs Ward commented that “four rooms that had been added spoiled the house”. The front verandah posts were iron with lace along the top. The back verandah was paved with sandstone. The home was originally run as a dairy, and also produced fruit and vegetables from a small orchard. A horse or two would also have been kept with a sulky for transport for the family. Mrs Ward’s description of Seven Oaks shows what an appealing location the Hendersons had chosen for their new home with buttercups and wild violets growing in the grass and a small creek running through the paddock to the dam. .The surrounding roads carried little traffic and there was dense bush surrounding the property extending to Rookwood, Flemington and beyond with only dirt bush tracks for cattle. 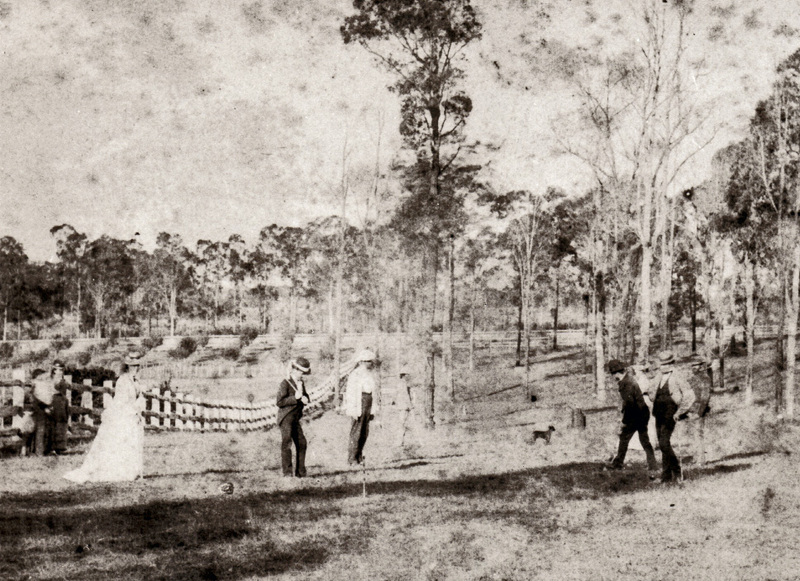 The photos show typical Australian bush partially cleared and a group of people appearing to be playing croquet, one of the few sporting activities considered respectable for women to participate in. Given their attire and the unevenness of the ground it would not have been easy to play and would have fallen far short of playing croquet on the manicured lawns of the English country residence that they were undoubtedly doing their best to imitate. It also shows that their dress was not adapted to the Australian climate but remained firmly fixed to British fashion. The women would have been sweating through scorching summers in tight laced corset, voluminous under clothes and long dresses in heavy fabrics. The men equally uncomfortable wearing three piece suits of serge or tweed, not discarding their waist coats even in the hottest weather. Whether male or female hats were also regarded as an essential item of clothing. Thomas once again mortgaged Lot 3 of the property in October 1874 with the Industrial & Provident Permanent Benefit Building & Investment Society. It is unclear why he needed these additional funds although it is possible it was used to expand the dairy or his herd of cattle given the productive nature of this part of the business as described by Mrs Ward. He may also have used the funds to purchase the property “Monmouth” in Albert Street, Burwood as a home for his daughter. Betsy Deane and her children. The mortgage was discharged on 30September 1876. Margaret did not have long to enjoy her country home. Just a year after these photos were taken and barely six years after their home was built she suffered a stroke and died four days later on 5 May 1875 at the age of 57. Her death certificate shows that she died of apoplexy at her home, Seven Oaks. As was expected Margaret would have been laid out in her home until the time of her funeral. The house would have been plunged into deep mourning with windows closed and mirrors covered and the family wearing the black of full mourning with death procedures followed as was the proper etiquette for the period. Margaret was buried in the Church of England Cemetery at Enfield following funeral rites in the church. As a widower Thomas observed the requisite minimum six months period of mourning (although in some cases widowers continued in mourning for up to two years) with the wearing of a black suit, black hatband and armband. On her death Thomas’ life started to fall apart. Margaret had fulfilled the duties expected of a wife during the 19th Century ensuring her husband’s comfort, accompanying him to the other side of the world, preparing their children for their proper stations in life as well as caring for her husband’s interests. Margaret had run her household well and managed it within the boundaries of her husband’s income a factor that Thomas was soon to find was now a great loss to him. It was barely six months after Margaret’s death that Thomas remarried. The shortness of this period following his first wife’s death is likely to have been considered quite scandalous. His choice of a second wife, Mrs Margaret Thomson of Forest Lodge, proved to compound his problems rather than improve them. She has been previously married to Archibald Thomas, a tobacco manufacturer, who had died in 1870. She had one daughter who was a married adult. To support herself, Mrs Thomas had continued to run a tobacconist shop which her husband had established. This would not have been considered a suitable occupation for a respectable woman. Smoking was a masculine pursuit and perfectly acceptable for men but definitely not so for a lady and for a woman to be involved in such trade even less acceptable. It is possible that Thomas’ unmarried daughters, Mary, Janette, Caroline and Fanny, who may have been living at home would have been so distressed by their father’s remarriage decided to move out of the family home at Seven Oaks. All of this was not sufficient for Thomas to reconsider his decision and he married Margaret Thomson on 27 November 1875. By March 1878, his marriage had failed and Thomas had separated from his second wife, the house at Seven Oaks had been let at eighty pound a year and Thomas had been declared insolvent. In evidence he gave before the Chief Commissioner the separation appeared to have been bitter. There were a number of liabilities incurred by Mrs Henderson and she had sold furniture and cattle but there was some dispute as to whether this property had belonged to Mrs Henderson prior to her marriage or if it belonged to her second husband. Prior to her marriage to Thomas his second wife had mortgaged her property for about eight hundred pounds. Thomas had been unaware of the debts that his second wife had incurred against her business and was shocked to find that “they were considerable” and the “equity on the redemption of Seven Oaks was sufficient to meet .. claims”. On his separation from his wife he went to live with his family, shocked and ill at the repercussions of his second marriage. His second wife had taken up residence with her only daughter and was still involved with litigation some years later regarding debts she incurred in 1886. Records show that she died at her daughter’s home in 1905. Thomas fortunately had the support of his son Charles and the friendship of Mr Billyard who lent him money to pay off his wife’s debts and allowed Charles to purchase the property. An attempt was made in court to show that the sale of Seven Oaks by Thomas to his son Charles should be considered fraudulent and void. It was proven that the sale price was reasonable given the mortgages held over the property and the case was dismissed. A Memorandum of Transfer dated 10 May 1877 shows that Charles paid his father a total of £600 for the entire property. This transfer records the value of the mortgage as £700 and interest and these mortgages were transferred to Charles. The death of Margaret seemed to be a sign of upheaval to come for the rest of the family. After only ten years of marriage Betsy’s husband Joseph Boardman died in 1877 leaving her a widow with young children. In the midst of the turmoil of the failure of his father’s second marriage and ensuing insolvency Charles met and married Francis O’Ferrall in 1878. In 1883 Alice married Frank Morris having one child before her early death in 1885. Thomas was to see five of his children die within a five year period. Fanny and Alice both died in 1885. Alice had only a short life, dying from phthisis on 24th August 1885 shortly after the birth of her daughter Dona. Her death was closely followed by Fanny who also died from phthisis on 22 July 1885 at Camp Street, Grenfell. The notice of her death published in the Sydney Morning Herald, stated that she was living “at the residence of her sister” she had been suffering from phthisis for a period of six years. 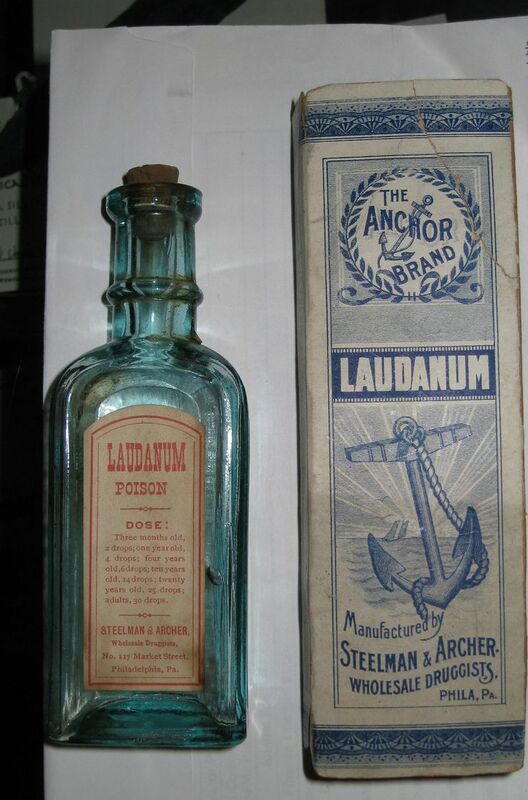 Laudanum, an opium based painkiller, was one of the treatments prescribed for tuberculosis during this period. It was only three years later that Mary died on 17 February 1888. She had never married and had been living in Moss Vale at the time of her death from paralysis. She is buried in the Bong Bong Cemetery near Moss Vale but no headstone survives. The following year his daughter Caroline died on 15 August 1889 in Mittagong, only thirty-eight years old, like her sisters Fanny and Alice, she was a victim of phthisis from which she had been suffering for four years. Although no headstone marks her grave the records show that Caroline was buried in the cemetery at Lower Mittagong, sometimes called Rowe’s Hill. His son Thomas who had never married also died from phthisis on 11 May 1890 and was buried in the churchyard of St Thomas, Enfield. At the time of his death he was living at a house named “Hilton” on the Parramatta Road, Strathfield. In 1886, ten years after he purchased the property from his father, Charles sold 8 acres of the Seven Oaks property for £4,500. During the boom period of 1880s to 1890s great mansions and significant houses were built for some of the most eminent and illustrious citizens of Sydney. Due to these changes in the area Charles made a substantial profit on his investment. 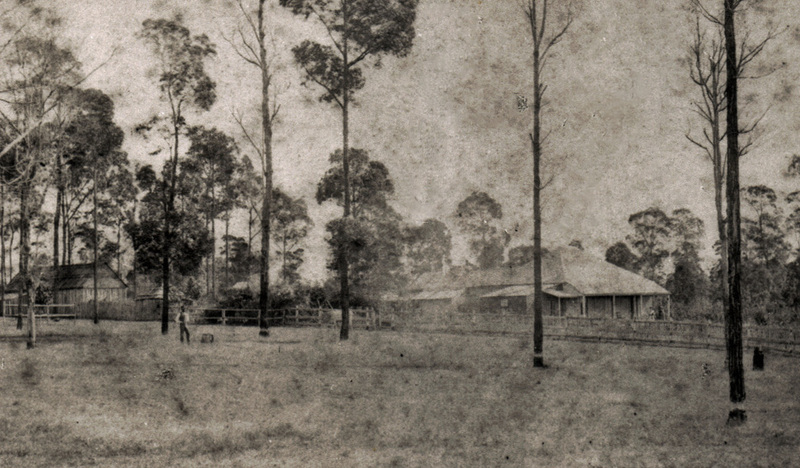 Charles sold the remaining portion of the property to Thomas Riley of Strathfield in November 1912 for £2,600. Thomas died in his 80th year. At the time of his death he was living with his daughters, Betsy Deane and Janette, in the house named “Monmouth” in Albert Street, Burwood. As “Monmouth”was the ship that rescued them on their journey to Australia it seems appropriate that the house that was their refuge at this period should also carry its name. He died on 22 November 1894 and was buried beside his first wife Margaret in the churchyard of St Thomas at Enfield.